This is the newly rebuilt and reopened Monbijou Bridge, which for as long as I can remember was a rough-and-tumble assembly of steel, concrete and currugated iron. It connects the Museum Island to Monbijou Park and Oranienburger Street. 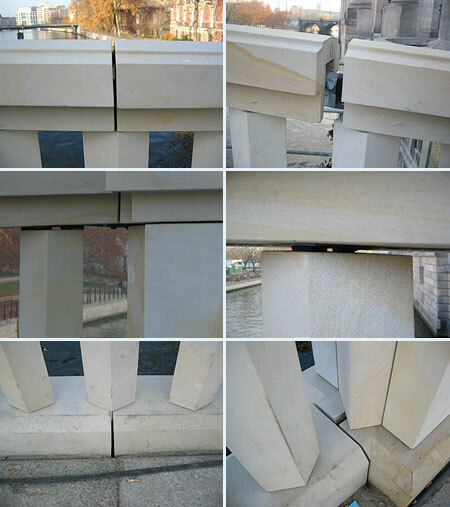 I rode my bike over the bridge this morning but was immediately taken by the amount of gaps left in the stonework. This is probably business-as-usual in the construction business where building with air seems to be an accepted norm. It’s particularly noticeable when stone-look foam panels fall off the facade of a building to reveal a 2cm insulating gap and the scrawny concrete structure beneath. Practical, but somehow soulless and shoddy. The gaps will probably be filled with cement, or, sooner, with chewing gum and cigarette butts, but you have to ask why the masionary wasn’t just made to fit in the first place. And you also have to ask yourself why an incomplete bridge was opened to such fanfair in the first place, and further, why almost two months later, it’s still full of holes. Oh dear. In a sprit of amiable curiosity, SLAB will be observing.